Hundreds of farmers have been gathering for Dairy Together Road Show events across Wisconsin this month. 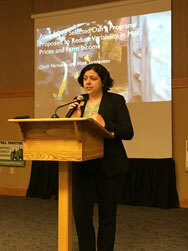 Organized by the National Farmers Organization (NFO) and Wisconsin Farmers Union (WFU), the events are engaging farmers on proposals to rebuild a viable dairy economy. Meetings have been held in Oshkosh and Eau Claire and another is planned tomorrow, April 4, in Platteville before the Road Show treks onward to Michigan, Minnesota, New Mexico and California. Farmers also gathered for Road Show stops in New York and Vermont. 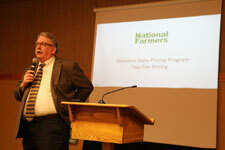 “The plans we’re presenting today move the industry away from consolidation and help level the playing field so independent farmers have a fighting chance,” Wisconsin Farmers Union President Darin Von Ruden said to the crowd of 100 farmers gathered at an April 2 Dairy Together Road Show meeting in Eau Claire. Levins noted that between 2000 and 2017, the U.S. lost 63,702 dairy farms with herds of 200 cows or less, a decrease of 65.6 percent. Meanwhile, operations with over 1,000 cows increased by 109 percent and those with over 2,000 cows by 268 percent. Recognizing the staggering rate at which the nation is losing family-sized farms, NFO is proposing The Family Dairy Farm Relief Act, a voluntary program that would base emergency relief payments on different tiers that recognize variations in operating costs for different size farms. Monthly payments would be set according to a farm’s level of production, with smaller farms receiving relatively higher payments per hundredweight. The plan is modeled off of the Maine Dairy Relief Program, which was implemented in 2004 and has effectively slowed the loss of dairy farms in the state. While The Family Dairy Farm Relief Act could provide short-term relief, WFU Government Relations Associate Bobbi Wilson echoed the point that it would be only a lifeline until long-term solutions can be implemented. Under the plan, farms could choose to expand production and pay the market access fee (ranging from $0.015/cwt to $3/cwt) or limit their expansion and receive a market access fee disbursement (ranging from $1.50/cwt to $1.88/cwt). Wilson noted this plan looks to better balance milk supply and demand and cause farms to reconsider expansions, an important effort considering milk production continues to climb despite continued farm loss and a glut of dairy on the market. The USDA recently forecasted 219.7 billion pounds of milk production for 2019, up more than 2 billion pounds over 2018. The Structured Dairy Pricing Program looks to curb production by establishing a national Federal Milk Marketing Order with a $4/cwt price adjuster for up to one million pounds of monthly production for every dairy farm in the country. The proposal would help reduce the cost of production difference between small and large farms in a way similar to FMMO procedures that account for different class prices. He reiterated the importance of addressing the continued loss and growing consolidation in the American dairy industry, citing an April 25, 2017 Hoard’s Dairyman article by Jack Britt that projects the U.S. could have as few as 1,300 to 1,900 dairy farms by the year 2066. That scenario is a direct contradiction to consumer preferences which trend toward a desire for family farms on the American landscape, Bylsma noted.